“Believable” agents are supposed to “suspend the audience’s disbelief” and provide the “illusion of life”. However, beyond such high-level definitions, which are prone to subjective interpretation, there is not much more to help researchers systematically create or assess whether their agents are believable. 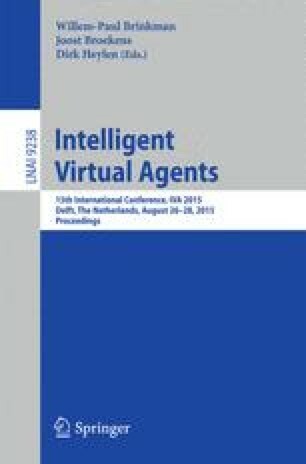 In this paper we propose a more pragmatic and useful benchmark than believability for designing virtual agents. This benchmark requires people, in a specific social situation, to act with the virtual agent in the same manner as they would with a real human. We propose that perceptions of mind in virtual agents, especially pertaining to agency – the ability to act and plan – and experience – the ability to sense and feel emotion – are critical for achieving this new benchmark. We also review current computational systems that fail, pass, and even surpass this benchmark and show how a theoretical framework based on perceptions of mind can shed light into these systems. We also discuss a few important cases where it is better if virtual humans do not pass the benchmark. We discuss implications for the design of virtual agents that can be as natural and efficient to interact with as real humans. This research was supported in part by grants NSF IIS-1211064, SES-0836004, and AFOSR FA9550-09-1-0507. The content does not necessarily reflect the position or the policy of any Government, and no official endorsement should be inferred.